I’ll be the first to admit that I have been watching a lot of films from the Asian continent recently. You have to admit, with an area holding as much of the world’s population, there is going to be a lot of creative output. It’s also interesting to see the influence of Western culture on this specific medium. The story is well placed for the time period, and the characters are varied. 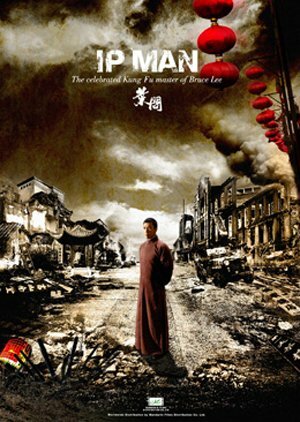 The main story centers around martial arts master, Ip Man, during the 1930’s invasion of China by Japan. Sometimes the side stories get a little in the way, but they do help the main plot most of the time. Everyone fulfills their parts pretty well. Even some of the more “stock” characters are atleast two-dimensional. I appreciated that the main villain, a Japanese general, had a second in command to be the more asinine in his actions, so that the general could remain more respectable. Beautiful sets framed perfectly. They also really got the period look right as well. Only once in a while can you tell that some of the sets are sound stages. Fantastic fighting effects executed with a furiously paced style. The sound effects do a great job of highlighting the fight scenes. I liked the methods and realism concerning the fighting, especially when Ip Man first enters the general’s arena to fight. Everything comes together well in this wonderfully composed martial arts film. The fact that it’s based on a true story is cool too. Great for any fan of martial arts movies. Also good for a movie night with friends. This entry was posted in Uncategorized and tagged 365, action, challenge, cinema, critic, drama, film, films, Ip, Kung Fu, Man, movies, review, violence, year. Bookmark the permalink.